The characters of different languages have different representations. If we combine the languages with the font types and styles - it makes a large set of characters to be recognized from an image. Aspose.OCR for Cloud handles this task very precisely. It can recognize recognise text in English, French and Spanish languages at the moment. Aspose.OCR Cloud is delivered over HTTP as a REST API with responses delivered in JSON or XML format. Our API has predictable, resource-oriented URLs, and uses HTTP response codes to indicate API errors. You can see our API detail here. The Aspose.OCR Cloud API are secured and required authentication. Developers can create app access key ID (appSID) and app secret access key when they register. Authenticated requests require an signature and appSID query parameters. Signature is computed by encrypt the request URI using HMAC_SHA1 with app secret key. You can see complete detail here. Cloud SDKs are wrappers around REST APIs in various programming languages, allowing you to process documents in language of your choice quickly and easily, gaining all benefits of strong types and IDE highlights. Please check Aspose.OCR GitHub repository for SDKs along with working examples, to get you started in no time. Aspose.OCR Cloud API Reference is the easiest way to try out our API APIs right away in your browser! With the It allows you to effortlessly interact and try out every single operation our APIs exposes. The Aspose.OCR Cloud API Reference. 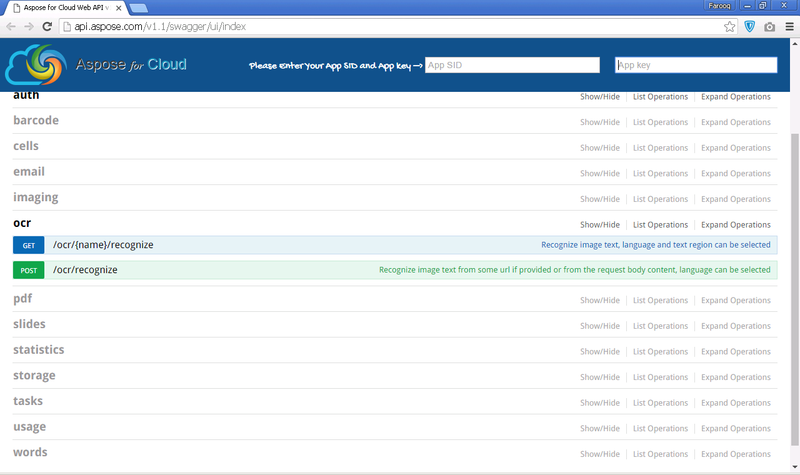 This is a collection of Swagger documentation for the Aspose Cloud APIs. You can get information about all the resources in the API. It also provides testing and interactivity to our API endpoint documentationAPIs are secured and requires authentication. Please create your Aspose for Cloud account (if not already created), Create new app and Get your App Key and App SID. Aspose Cloud REST APIs can be authenticated using either OAuth 2.0 or URL Signing. Please check Authenticating API Requests article for more details.